This book contains the essential information you need, boiled down to their essence, so that you can create the life you want. Many people have heard of the principle that “Like attracts like,” popularized by such famous authors as Napoleon Hill and Wallace Wattles. Although many have heard of these principles far fewer truly understand it and fewer than that practice it. 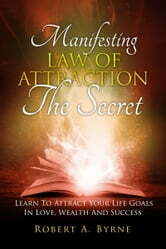 This book will help you learn to control this god given power to control your own thoughts and thereby your destiny. You can have what you most firmly desire. What the mind can see it can achieve. This book can show you how. on your e-Reader, computer, tablet or smartphone.